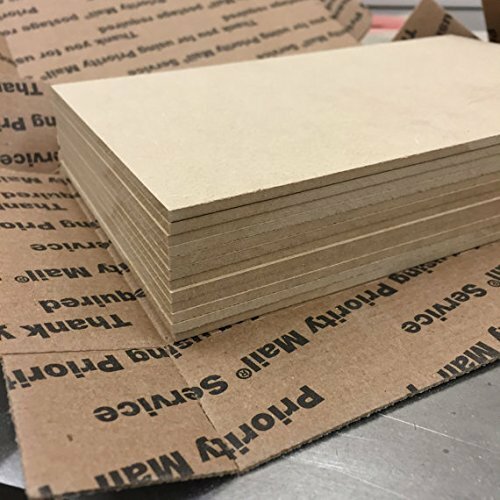 Here is a Small Flat Rate USPS box - PACKED with sheets of 1/8" MDF - thats' Medium Density Fiberboard, in case you wondered! It is PERFECT for crafting or painting. Do you make small signs or plaques, or perhaps teach a tole painting class? These would be excellent for perfecting your skills. These sheets measure 4" x 6" " and would be great for mixed media crafting projects, too. Doll house building? Journal covers? Materials for home-schooled projects? Perfect! I've even sold a few boxes of these sheets to people with laser engravers and CNC machines - this stuff is perfect for experimenting and working out your bugs before you cut the good wood. This Small Flat Rate box holds 13 pieces of these 1/8" MDF.